In the run up to the EU referendum we’ve heard every kind of claim and counter-claim by the official Leave and Remain campaigns. The truth is, both sides are being led from a right wing, committed to building up the power of an ever-shrinking elite. But who’s going to discuss our interests in the debate? Will being in or being out deliver a more humane society? 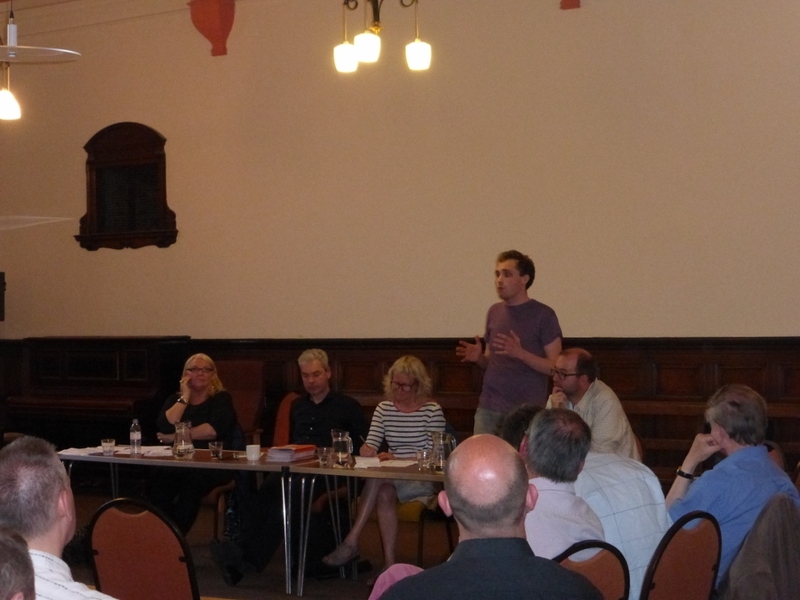 On Tuesday 6th June York People’s Assembly gathered together a mix of social justice, workers’ rights and environmental campaigners to discuss what would make a better world. This included War On Wants’ John Hilary and Left Leave campaigner Maxine Bowler to represent the Leave side. Whilst Green Councillor Lars Kramm and ‘Another Europe Is Possible’s Michel Chessum putt the case for Remain. Thanks also to the more than fifty people who came to take part, rather than staying at home at listening to David Cameron and Nigel Farage on television. Sally chaired the meeting and introductions were made by Chris and Jane outlining as well the York arm of the Convoy to Calais on June 18th, along with a request for funds for that, and to pay for the room and expenses. York People’s Assembly is not taking a position on Leaving or Remaining – doing so would undermine the diverse spread of passionate people who make up the group. We wanted to create the possibility of a fresh debate on new terms. Whilst the debate was open and maintained a civility throughout it was accepted by all the speakers that the racist elements in the public debate were fuelled by concerns over immigration, and that this needed to be debated by the left. However all speakers considered that immigration had always existed and should continue to happen but this was marred by the neoliberal 1% seeking to exploit workers, whether in country of origin and at their destination.and using them as scapegoats for austerity.